By Kristen Lomasney on July 16, 2018 at 5:22 p.m. If you're a fan of Tested and you're attending Comic-Con, we have some ideas for you. We always publish a "where to find Adam Savage" blog post, but this year, we thought we'd include our friends too! And if we're missing anybody, please post your suggestions in the comments below. 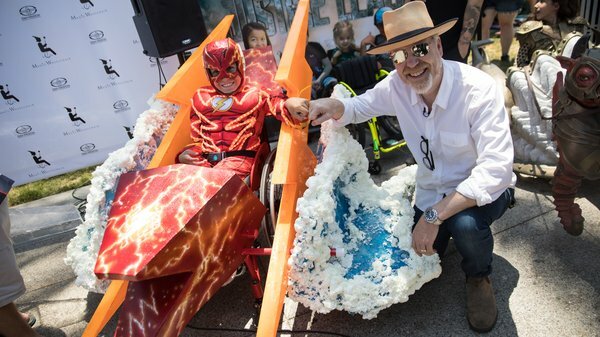 Magic Wheelchair is a nonprofit organization that has garnered international attention for creating epic wheelchair costumes and promoting inclusive cosplay. Hear from the SDCC 2018 Star Wars Magic Wheelchair Team: Fon Davis (FONCO Studios), Tom Spina (Tom Spina Designs and Regal Robot), Michael McMaster (McMaster Robots, Team Echo Base), Gordon Tarpley, Norman Chan (co-founder of Tested), James Powell (Monster City Studios), Sean Fields (Project 842), Tony Le, and others as they discuss their experience of building these face-meltingly awesome costumes, the impact of inclusive cosplay, and how you can get involved. The Fleet Science Center is debuting its MythBusters exhibit! Starting at 6PM, head to the Fleet Science Theatre for a chat with Kari Byron, Tory Belleci, and Grant Imahara. At 7PM, you'll head into the Fleet Science Center's MythBusters: The Explosive Exhibition and check out props from the show with Kari, Tory, and Grant. Physical effects crew Weta Workshop (Blade Runner 2049, Elysium, Chappie, District 9, Lord of the Rings trilogy) and director Grant Sputore along with Michael Green share how the titular robot of I Am Mother was brought to life. From designing and prototyping to the filming experience, discover one of the most complex builds that Weta Workshop has ever attempted. See Grant and the crew reveal the robot for the first time. Since its launch in 2003, the MythBusters television show has entertained audiences around the world. But MythBusters was never intended to be solely for entertainment purposes. Rather, the show and its iconic pop-culture hosts have sought to highlight the science involved in discovering the truth behind popular urban legends. Kari Byron, Tory Belleci, and Grant Imahara discuss MythBusters and compare notes with local scientists Dr. Angela Kemsley, Dr. Tiffany Chow, Dr. Brian Keating, and Dr. Steven Snyder on the scientific methodology for experiments and why failure is not only encouraged but also a necessary part of research and discovery. Ever wondered if lightsabers could one day be a reality? Curious about which Star Wars droid NASA would take into space? Is there a form of fuel that could keep The Resistance out of reach from a First Order fleet? Expert panelists Kim Steadman, Emily Manor Chapman, Kieran Dickson, Fon Davis, Travis Langley, Steve Huff, Eliot Sirota and host Jenna Busch (creator, Legion of Leia) act as your Bor Gullet into the mind of Star Wars creators and break down the science behind a galaxy far, far away. Fon Davis (model maker, SFX expert on Star Wars episodes), Don Westos (mold/resin production expert), and Sam Girgis (BiggerBoxModels) discuss all aspects of garage kit modeling and utilizing 3D printing techniques for new and existing home business ideas. Kari will be signing copies of her book Crash Test Girl at the Harper Collins booth #1029 (it's an awesome book if you haven't read it). Learn how a board game goes from concept to your table from Mike Gonzales (Activision, Weta Workshop), Matt Hyra (Cryptozoic Entertainment), Ross Thompson (IDW), Jason Brenner (PlayFusion, Upper Deck), Matt Fantastic (killjoy), and Andrew Wolf (USAopoly). A Q&A session about design processes and more will be moderated by Adam Sblendorio (VP, Creative Cryptozoic Entertainment). Past and future collide when Wild West fantasy requires robots with advanced A.I. What is the appeal of live-action role playing? When is artificial intelligence simply intelligence? Where is Westworld? And how far will people go in pursuit of violent delights? For a look at mysteries of human nature past, present, and future, see this posse of experts wearing both white and black hats: Dr. Travis Langley, Fon Davis, Steven Huff, Allen Pan, Sarah Petkus, Tamara Robertson, and Dr. Martin Lloyd. Moderator Jenna Busch asks: How is the Westworld won? Many Tested friends also have booths at Comic-Con, including WETA workshop and Jackie Huang. Here's the full list of exhibitors. And don't worry, we're filming as much as we can while we're there!